My partner's 11 year old son sits in front of his X-box. Via his head set, he and his disparate chums frantically and noisily negotiate a deluge of virtual hazards ~ warriors together. These 'multiplayer' games have become hugely popular, with 'single player' apparently relegated as a last resort when no-one else is around. Why? It's obvious - team games are so much more fun. But let's dig deeper. We humans are social apes, evolved to be tribal; our 'multiplayer' tendencies hard wired. Indeed, those that don't belong are exposed and vulnerable ~ ask any child alone in a playground, fearful of that most hurtful of jibes - 'loner'. Beyond child's play, adult life is packed to the gunwales with a plethora of 'belongings' - our nature seemingly driving us to belong. But there is a flip side because to belong necessarily defines you as separate from, or sometimes in conflict with, those who do not belong. Such conflicts have ranged from minor tiffs to genocide, but science tells us there are some 'collectives' to which it is impossible NOT to belong. We ALL belong to the human race, and beyond that, unless you or your culture elects to deny the evidence, all our families go way, way, WAY back! On walking into my friend's house recently I was greeted by a wall of photographs including relatives going back to Victorian times. I made the mistake of suggesting family resemblances and quickly found myself embroiled amongst the details of their extensive family tree. Such matters run deep and we speak of 'our roots'. Amongst all the 'who begot whom' we define and quantify our family belonging. But we can go deeper still and discover our racial and/or geographical origins and more recently, some now even possess their entire DNA profile. Amongst all the genetic code a far deeper belonging is confirmed. But such knowledge flies in the face of our instinctive drive to generate 'them and us' scenarios - defining the people we meet as either members of our own particular in group - or not. In our not so distant evolutionary past it was undoubtedly prudent (survival wise) to be very wary of non family members, but our species' success in modern times has relied significantly upon an ever widening circle of acceptance and compassion. Indeed many of today's most dominant cultures insist upon such tolerances in law. Inexorably such thinking has prompted us to include non humans within these circles. More generally, human expressions of belonging are celebrated with a super abundance of festivities around the world. They mark all manner of things and their scale and scope are bewildering, ranging from meet ups to cup finals, and from rallies to pilgrimages. This article offers you one more. An event that celebrates 'belonging' itself - and about as deeply and widely as it's possible to do so. Charles Darwin and Alfred Russell Wallace explained how all life belongs in the uber family tree we call the 'Tree of Life'. They gave us a mechanism for how one life form can evolve and diversify into many. As stated earlier- unless you or your culture elects to deny the evidence, we all belong in one enormous family we call 'Life on Earth', and yet nowhere do we find an annual celebration of these origins. This simply isn't good enough! Given the 4 billion years of extinction avoidance every living thing has negotiated thus far, it seemed appropriate to make such an event a celebration, and in a nod to the extraordinarily long journey we've shared thus far, surely it should be a pilgrimage? I should add that in no way is our adoption of this term intended as disresctful to religious pilgrimages. The term pilgrim itself is qualified as someone on a journey or a foreigner. The Ancestor's Trail began in 2010 in response to the International Year of Biodiversity and Darwin's 150th anniversary the year before. Inspired by a book written by Richard Dawkins and Yan Wong called the Ancestor's Tale (recently updated), it's an annual event celebrating 'our place' within the biodiversity machine we call evolution. Like all pilgrimages it's a participatory event and so, although alone we may start, together we shall gather. Picture if you will the evolutionary Tree of Life. Its profusion of leaves each representing a single species of life on earth. Clusters of closely related species form branches. Our 'human leaf' holds on right beside that of the chimps and other apes. Of course many other leaves have long since perished, or seem destined to lose their precarious hold all too soon. Indeed, viewing the picture over the fullness of life's history, we extant species shrink into a highly fortunate but tiny minority of survivors. And survive we have, despite repeatedly being pitted against all the odds down through the millennia. A simple enough analogy, but there is no denying the potent truth sparkling within Darwin's original tree of life sketchbook scribble - a truth that has changed forever our perception of who we are. So how does the Ancestor's Trail work? Essentially you walk evolution - in reverse - starting at the present day and symbolically travelling back in time to our shared origins. Dawkins and Wong explain in their book 'the conceit of hindsight' where we have previously viewed human-kind placed at the top of the tree as a 'pinnacle' of evolution. Biologically speaking, they rightly dispel this view, placing us with equal status to any other species. To avoid further conceit, in their book they rewind evolution such that our human journey becomes just one of millions of species heading towards our shared biogenesis. 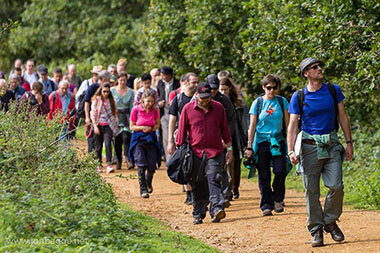 With this in mind, our event drapes the tree of life over the landscape such that its branches line up (broadly) with local footpaths to create a network of merging trails across Epping Forest and Lee Valley Park. On the day we populate the tips of specific branches with people representing different life forms, including ourselves. With a little pre arranged choreography, we engineer the walking times so that each group of walkers merge in turn recreating a backwards version of evolution. In this way, our ever increasing band of pilgrims arrives together at the dawn of life. Most people walk the human line of evolution and will therefore sequentially rendezvous with people walking as chimps, New World Monkeys, gazelles, birds and plants. Strictly speaking all these trails should be the same length, seeing as all extant species come from the same origins with lineages that have been on the planet just as long as ours. However, not everyone is keen or able to walk 13 miles and so we made the trails many different lengths so that walkers can choose their walking distances through the Trail they adopt. For less hearty walkers or younger families, there are trails from 3 miles upwards. On specified trails, marshals will lead groups up to the main trail rendezvous to make sure people don't get lost! The event is organised by Humanists (non believers) but given the inclusivity it celebrates, we warmly extend an open invitation to all - including the odd non-human! (mostly, but not exclusively, dogs). Previous trails have attracted well over 100 walkers. This year we will again be raising funds towards an online version of the tree of life called 'One Zoom' created at Imperial College London. A brisk walk to the origin of life - who could hope for a better destination? A biological pilgrimage in Epping. Quite interesting! Bears, birds and bees have their own paths through the world, but we human beings are the only ones who can appreciate this trail back through time to the beginning of life. What a fine nature walk! Congratulations on this great thing you've created. The Ancestor's Trail: a truly 'origin'al idea. TED lecture by Jon Haidt on humanity's penchant for belonging. The countryside in the area is achingly beautiful, and the talks of the night before had been the perfect set-up because we all spent the entire hike distracted and entranced by every bird, butterfly and spider we saw. I thought everything was absolutely excellent, well organised and thought out,imaginative and entertaining. I loved walking the trail and all the music, poetry and dance. All the timings worked wonderfully. The Quantocks are beautiful. Thank you so much. A really heart-warming, uplifting experience. It was such a beautiful experience! The talks were riveting, the people beautiful - thank you! We (me + dog) had a grand day out on the Ancestor's Trail - great opportunity to meet interesting people, wonderful scenery, amusing entertainment, long (13 Miles) but not too taxing walk and a chance to learn more about the extraordinary timescale of evolution. It was truly a privilege to be involved. We both had an absolutely brilliant weekend - such a great idea & impressively organised! I hope it continues for many years to come.